Why are ISTQB Software Testing Certifications Important? I firmly believe that ISTQB Software Testing Certifications are extremely important. As both a QA professional and QA hiring manager they are tools I have used to both learn more and evaluate future and current employees. As a hiring manager, it shows me that individuals are willing to invest time and effort and are committed to the software testing profession. I know the effort and commitment that it takes personally since I have two ISTQB certifications currently. If I have to evaluate two candidates who have a similar background, but one has an ISTQB test certification, that will usually be the separating factor with my hiring process. ISTQB Foundation Level: The Foundation Level qualification is aimed at professionals who need to demonstrate practical knowledge of the fundamental concepts of software testing. This includes people in roles such as test designers, test analysts, test engineers, test consultants, test managers, user acceptance testers and IT Professionals. The Foundation Level qualification is also appropriate for anyone who needs a basic understanding of software testing, such as project managers, quality managers, software development managers, business analysts, IT directors and management consultants. ISTQB Agile Tester Extension: Agile testing is a relatively new approach to software testing that follows the principles of agile software development as outlined in the Agile Manifesto. A tester on an Agile project will work differently than one working on a traditional project. Testers must understand the values and principles that underpin Agile projects, and how testers are an integral part of a whole-team approach together with developers and business representatives. There is a lot of confusion concerning agile testing – which means there’s an educational opportunity as well. The Agile Extension will give the tester the knowledge to be part of agile testing teams and achieve high performance. ISTQB Model Based Tester Extension: Model-based testing is an innovative test approach to improve effectivity and efficiency of the test process. 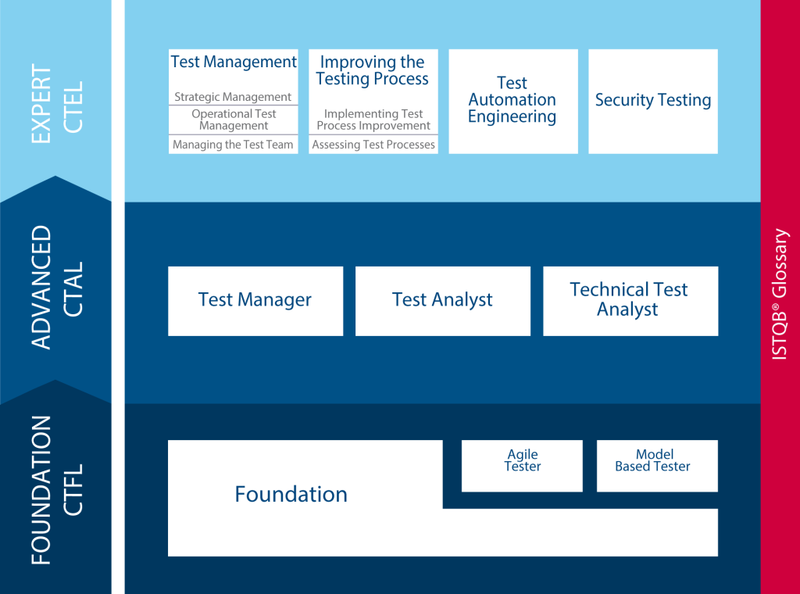 A model-based tester on a project uses models to drive test analysis and design, and keeps advantage of the models for other testing activities such as test implementation and reporting.ISTQB® Model-Based Tester certification complements the core foundation level as a specialist module. It provides a practical and easy entry to the MBT approach. ISTQB Advanced Level: The Advanced Level qualification is aimed at people who have achieved an advanced point in their careers in software testing. This includes people in roles such as testers, test analysts, test engineers, test consultants, test managers, user acceptance testers and software developers. This Advanced Level qualification is also appropriate for anyone who wants a deeper understanding of software testing, such as project managers, quality managers, software development managers, business analysts, IT directors and management consultants. To receive Advanced Level certification, candidates must hold the Foundation Certificate and satisfy the Exam Board which examines them that they have sufficient practical experience to be considered Advanced Level qualified. ISTQB Expert Level: The Expert Level extends the knowledge and experience obtained at the Advanced Level by providing in-depth, practically-oriented certifications in a range of different testing subjects. With Expert Level ISTQB® offers career paths for testers with clearly defined business outcomes. Hopefully this information on ISTQB Software Testing Certifications has been helpful. Please consider taking one or many of these certifications to help you land to increase your career opportunities or land your next dream job. In today’s job market, it is important that you do everything you can to expand your career opportunities. As as hiring manager, I know how challenging the competition is and the lengths that potential employees are going to in order to land their dream job. Here 5 steps you can take to compete with your peers. It is important that you periodically update your resume. This will help you remember important things that you have done within your current positions. It really helps if you can provide specific metrics. If you have saved the company money through test automation, you should quantify those numbers. In addition to keeping your resume current, it is critical to have an outstanding design. After all, you need to be able to separate yourself from the competition. I believe it is worth it to pay someone to update your resume, it will pay off in multiple dividends when you land your next job. This is the first step that I recommend in expanding your career opportunities. It is critical that you spend significant time building your network. LinkedIn makes it relatively easy to stay connected with your network. I recommend keeping your network current. You never know when you see a dream job where one of your network connections works. It makes it a lot easier to get the initial interview, when you have an internal connection. You also need to do a good job if you have worked somewhere previously, so they can provide a credible reference. Nobody wants to recommend someone who has the potential to damage your reputation at the company where they currently work. Facts indicate that having a strong network will greatly increase your chances of landing your next job. This is the second step that I recommend in expanding your career opportunities. As career opportunities increase, it is important to keep your technical skills updated. Chances are when you move to a new job, you will need to learn new skills. Those skills can be soft skills such as presentations or management or they can be technical skills such as learning a new application such as PowerPoint or Visio. For technical skills there are many online training options available such as: Lynda, Udemy, and Coursera. There are many jobs which require certain degrees. If you are looking for a job in counseling, it will often require at least a masters degree. If you are planning on being a professor, they will require a doctorate. If you are in business, an MBA will be preferred. While in some jobs it may not be required, it will certainly be a plus and will increase your chances to boost your career opportunities. As a hiring manager, since I have multiple degrees, I will lean towards someone who has advanced degrees since I know the amount of money, time, and effort that is involved. If you are in IT, I get asked this question a lot. Is a software test certification worthwhile. My answer is simply yes. I have two ISTQB software testing certifications, and I am glad I have them. While it is often not required, it does help. It takes money, time, and effort to get them, but they do help. Not only does it separate me from the competition, it increases my knowledge on software testing. I hope these steps will greatly increase your chances at your next career opportunities. I will be publishing more information that will help you get your ISTQB Foundation CTFL certification in the upcoming days.